If innovators have their way, you’ll soon start seeing blockchain beyond the realm of cryptocurrency. People have been thinking creatively about how to use the technology powering Bitcoin to do things like shake up how people vote or access their birth records. Now, pioneering Harvard and MIT geneticist George Church (of CRISPR and mammoth-resurrection fame) has a new startup that plans to use blockchain technology for genome sequencing — but it’s not yet clear whether it will be popular enough to edge out the competition. The startup, dubbed Nebula Genomics, seeks to change how companies handle an individual’s DNA. Though companies like 23andMe have become popular and thousands of people have gotten their genomes tested for things like their ancestry and health conditions they might pass on to their children, most people still haven’t had their DNA sequenced. Some of the reasons may be that the test is still fairly pricey, plus consumers aren’t assured much privacy in doing so. That’s where Nebula thinks it can do better — consumer-patients can get paid for submitting their genomic information, and ensure it’s safe in the process, according to a white paper the company recently published. Companies like 23andMe and AncestryDNA are “middlemen,” acquiring people’s DNA, then selling it to pharmaceutical and research companies for millions of dollars. Nebula wants to eliminate them. In their place, DNA/data owners will interface directly with DNA/data buyers. There will be no “middlemen,” as Nebula puts it. Owners don’t have to sell their information. After a person gets their results from Nebula, an app will allow them to “interpret their personal genomic data without sharing it with any third party.” As the app analyzes more DNA sequences, the information available to consumers will become more comprehensive. All data will be privately stored on Nebula’s network. Initial access is granted only to the owner, though they can give others access to it as well. Owners can also choose to store their data wherever they want, including on Dropbox. No real names will be required. Data owners stay anonymous. Organizations that want to buy users’ DNA have to be upfront about who they are, and all transactions will be recorded on the Nebula blockchain. Nebula tokens will be the sole currency on the network. Individuals use Nebula tokens to pay Nebula for their personal genome sequencing. 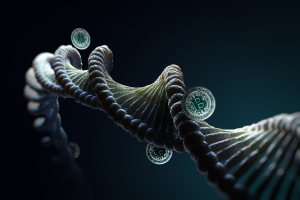 Entities looking to buy genomic data will pay tokens to gain access to genome sequences, purchased with traditional currency. It’s still pretty unclear what this would mean for the network, or how exactly people will exchange tokens. Buyers, such as pharmaceutical companies or academics, can conduct surveys targeted at DNA owners and provide Nebula tokens in exchange. These buyers can also offer to pay an individual’s genome sequencing cost if the survey reveals information that is particularly interesting to the buyer. Given the way genome sequencing industry currently works, integrating blockchain seems pretty revolutionary. But Nebula isn’t so unique, in fact— other startups such as EncrypGen, Luna DNA, and Zenome have indicated that they might build platforms for people to sell their own DNA, as Tech Crunch notes. The company won’t officially launch until later this year, giving the competition plenty of time to catch up. A harder question to answer: will people trust paying with Nebula tokens? As STAT News points out, both bitcoin and Ripple have experienced sizable drops in their respective values in 2018, and bitcoin’s might even fall farther. The idea of investing in a new cryptocurrency that comes with an expiration date may be a hard sell. And Nebula has some steep competition. Tests from 23andMe are popular, and incredibly simple (just give them your spit). The affordable $80 – $160 price is just low enough to seem worth it. Editor’s Note: A previous version of this article stated that it was unclear if real names are required. This version has also been updated to correct comments about the value of tokens changing as DNA sequencing becomes cheaper.